I love hearing about the details when talking with our couples. It’s amazing to see things come to life but when couples blow me away, exceeding my expectations.. well you gotta blog about it! Dana, an up and coming event planner, knew the day she married Stephen was going to be filled with beautiful flowers, a Nautica meets Hampton style decor, and Jimmy Choos. The couple chose to get ready in a downtown Harrisburg hotel, close to their first meeting/date spot before heading to their ceremony location at Stock’s Manor in Mechanicsburg. A few minutes prior to the ceremony, the wind started to kick up, the skies turning dark, and thunder was heard in the distance. Fearful if the outdoor ceremony would happen, Dana and her attendants arrived exactly at 4pm. The couple wed in the stone ruin area which Dana designed a vintage feel by adding large white frames and huge flower displays to the rustic setting. Just as the couple shared their first kiss, the rain drops started to fall. Dana created a magical reception space in the enclosed pavilion attached to the classic farm house with hundreds of candles and a soft sunset glow of up-lighting. The room smelled of spring which was loaded with fresh flowers and beautiful candelabras. The cake was designed with modern textures on each layer in classic white which melted in your mouth. The end of the evening brought the couple to the middle of the dance floor with remaining guests circling around, hand in hand. Such a beautiful event for a gorgeous couple! Thoughts on a Rainy Day Wedding- YAY or NAY? Although we don’t see it often, this year it seems May has been a bit… well damp. For couples (and their photographers) who are in love with an outdoor wedding, hearing the chance of rain on your wedding day can spur some depressing thoughts, however major kudos to our couples who experience this minor occurrence as all have shrugged off a little shower or major downpour and simply enjoyed their celebrations. The best way to offer thoughts and tips if rain is on the radar for your wedding can only be expressed by recapping Brianna & Travis’s wedding at the Lancaster Eden Resort. The fun and carefree couple had planned for an outdoor, courtyard ceremony with a short jaunt to a local Lancaster park for beautiful outdoor creative portraits, yet mother nature decided differently. Bri & Travis were definitely prepared (as everyone planning an outdoor wedding should) and snatched up beautiful matching umbrellas for their bridal party and a large black golf for themselves which from what I heard were a steal at 5 Below. Brianna and Travis’s attendants also took a page from the “How to be a gold star member of the bridal party” and made the best of it.. no complaints, no smugness, just happy and hilarious as the sky dropped huge buckets of rain during the bridal party shots. We even got a break in the rain just in time for the couple portraits! 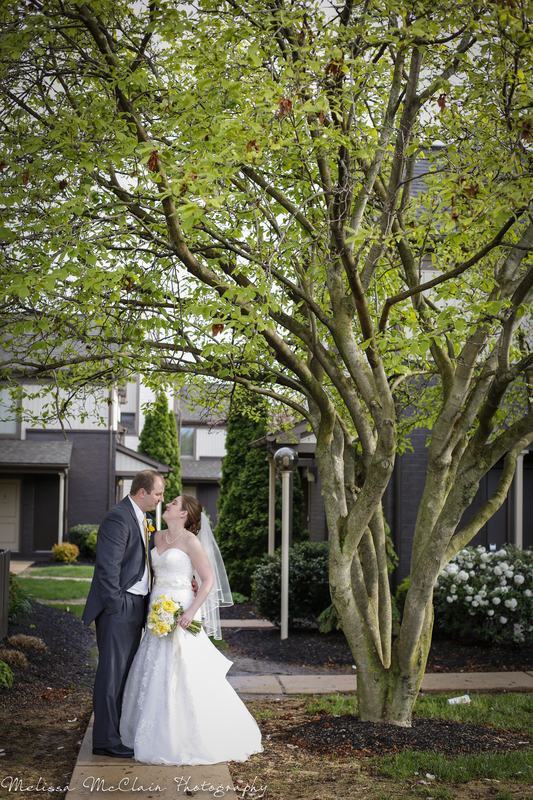 Click here for more details from Brianna & Travis’s wedding! Talk about a New York state of mind- this crowd was crazy! Kristen and Mike had guests from all over, many from New York, attend their outdoor and slightly misty wedding at Hunter Valley Winery a few days ago! When meeting with Kristen and Mike they explained the details of their day as a relaxing and fun reception filled with the largest (and tastiest) pink candy bar I’ve ever seen and multiple games of wiffle ball, horseshoes, and other fun lawn games! The one cool but not so cool part of their day was the cake. Due to the humidity the cake started to melt the icing details, which created a cool drizzle effect, however I believe it was a bit different from what the couple had in mind for their cake design. Either way it was delicious and smashed like any other cake would in the grooms face. Poor mike but such a great photo op! Congrats you two! They do say that rain is good luck on your wedding day! For Shannon aka Pip and Paul they should have some amazing good luck for the torrential downpours that went on all night post ceremony! One good thing, aside from the super sweet couple getting married of course, was the fantastic clouds that created quite a dramatic backdrop! We also can’t say enough good things about Pip and Paul and their entire bridal party, families and friends, for all of the great laughs, momentous spirit, and good times we were able to share! Having met both Pip and Paul only on their wedding day, I must say this is a very well matched couple, both with light hearted, good time personalities! >Our last wedding of the 2009 season was for Don and Janna held at Ski Roundtop Resort. What was planned to be an outdoor ceremony was unfortunately moved indoors due to rain, however in our opinion rainy day weddings make for some of the best pictures, especially in the fall months with the great color combination of the foliage! 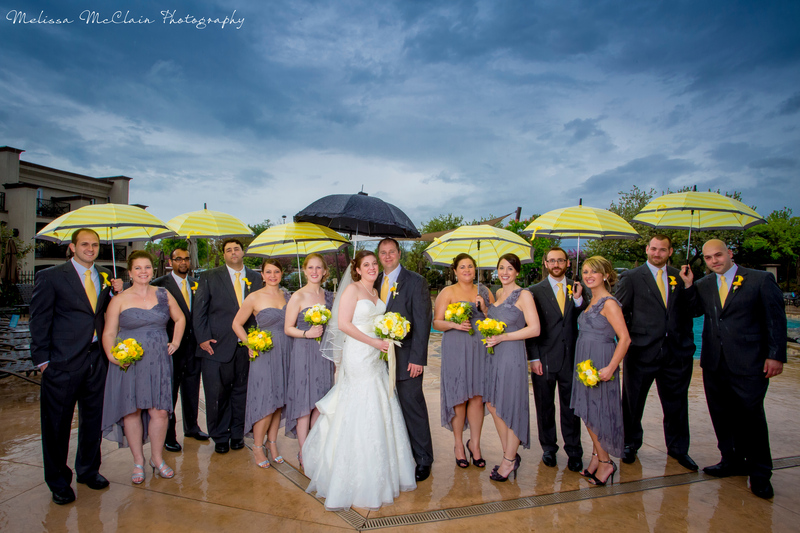 Janna was sure to grab enough black umbrellas for her crew which created some fantastic and classy outdoor shots! Post dinner their reception was hopping with some great music by one of the groomsmen and a break dancing display! What an awesome celebration for a fantastic couple!